Eight games, all availble on 3DS or Wii U. The newest Humble Bundle is live today, and it’s all about Nintendo. If you don’t know what Humble Bundle is, it’s a pay-what-you-want service that allows you to…well, pay what you want for certain games. Normally the payments are split up amongst Humble Bundle, the developers of the game, and charity, although you can customize where you want your money to go. For this weeks bundle, Nintendo fans will be able to know that all eight games available are playable on either the 3DS or Wii U. The list of games can be found below, but if you were to donate any amount, you’ll be getting Guacamelee! Super Turbo Championship Edition (Wii U), Woah Dave! (3DS), and Mighty Switch Force (3DS). Should you pay more than the average donation price (currently $9.21), you’ll get The Fall (Wii U), OlliOlli (Wii U/3DS), Moon Chronicles (3DS), and whatever other games get announced. Should you pay more than $10, you’ll get codes for every game listed above, plus Stealth Inc 2 (Wii U), and Steamworld Dig (Wii U/3DS). Needless to say, this a steal, and everyone who owns either system should be jumping on this. 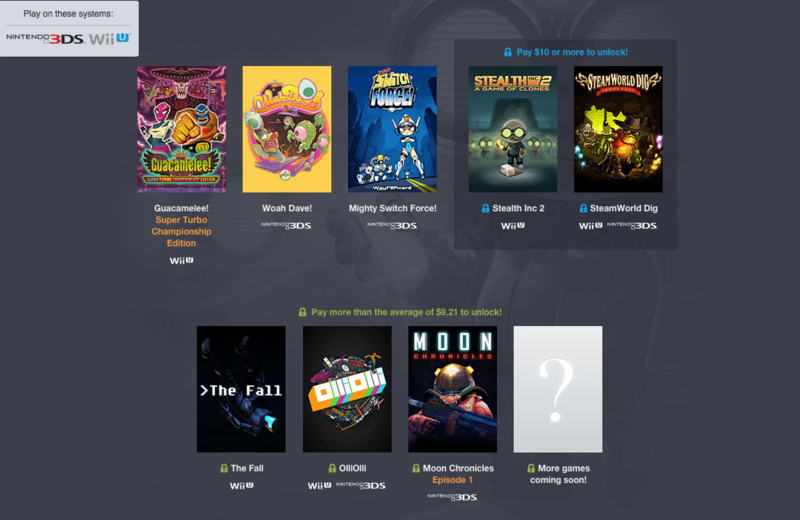 Will you be picking up the Nindie Humble Bundle? Let us know below!